“The technosphere encompasses all of the technological objects manufactured by humans. The technosphere comprises not just our machines, but us humans too, and the professional and social systems by which we interact with technology – factories, schools, universities, trade unions, banks, political parties, the internet. It also includes the domestic animals that we grow in enormous numbers to feed us, the crops that are cultivated to sustain both them and us, and the agricultural soils that are extensively modified from their natural state to carry out this task. The technosphere also includes roads, railways, airports, mines and quarries, oil and gas fields, cities, engineered rivers and reservoirs. It has generated extraordinary amounts of waste – from landfill sites to the pollution of air, soil and water. 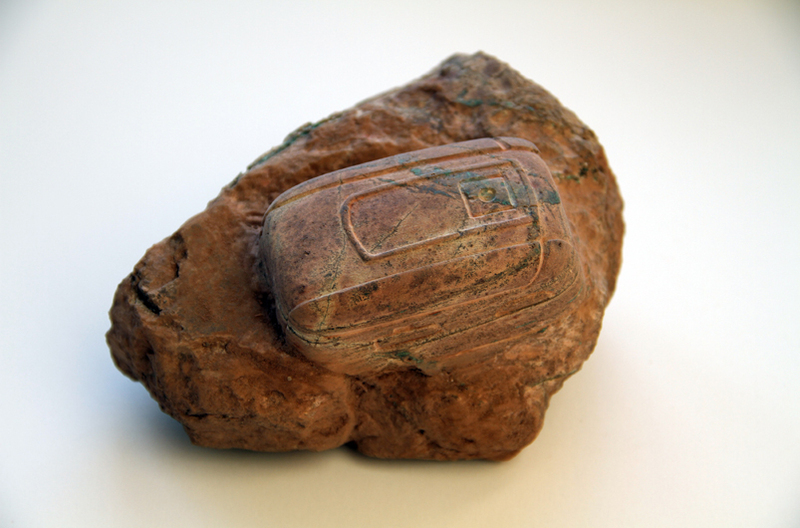 Technological objects, including mobile phones, may be considered technofossils geologically, because they are biologically-made constructs that are robust and resistant to decay; they will form future fossils, to characterize the strata of the Anthropocene. While almost all of the biosphere’s energy comes from the Sun, some of the technosphere is powered by solar energy too – and other renewable resources such as wind-power, but most is powered by the burning of hydrocarbons including oil, coal and gas. These non-renewable energy sources in effect represent fossilized sunshine that has been amassed deep in the Earth over hundreds of millions of years, and that is now being expended in just a few centuries. — Jan Zalasiewicz, professor of Palaeobiology at the University of Leicester, United Kingdom, from his essay “The unbearable burden of the technosphere”, in the UNESCO Courier. The photo is of a work by Maarten Vanden Eynde titled “Technofossil (Samsung E570), D.R. Congo, 2015”. It imagines the kinds of fossils we humans are leaving behind in the Anthropocene era. The piece is made from sculpted malachite rock, the rock mined in the DRC for copper to power our electronics. It is estimated that 40,000 children as young as four work in the DRC mines; an estimated 40% of all workers in the region’s mines are children (under the age of 18).